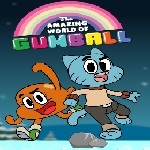 Description: Gumball was blind fooled and must be helped by Darwin.Make team with your friend to complete the game.Play up to 33 levels of Gumball and Darwin online game. 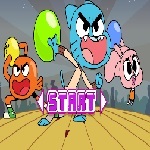 Instruction: Collect the rainbows,Dont'let Gumball to fall too far,Bounce Darwin over Carmen.Use landry baskets for long drops. Game Controls: Use WASD keys to play.